(TibetanReview.net, Feb24’16) – For having pictures of Tibet’s exiled spiritual leader, the Dalai Lama, in his mobile phone, China has given a two-year jail sentence to a Tibetan Buddhist monk in Rebgong (Chinese: Tongren) County of Malho (Huangnan) Prefecture, Qinghai Province, on Feb 17. 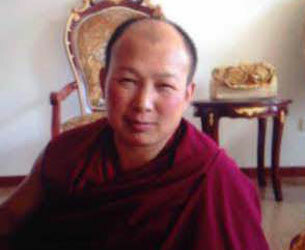 The monk, 47-year-old Gomar Choephel, of Rongwo Monastery, was accused of undermining social stability and engaging in ‘activities intended to split the motherland’. Chinese police were reported to have found the photos in his mobile phone after a raid in his monastery on Jul 10, 2015. He has also been criminalised for sharing those pictures online with others. The authorities gave no reason for his arrest at that time and there is also no information about his trial. He is currently being held in the county’s Drakmar detention centre, according to the Tibetan Service of Radio Free Asia (Washington) Feb 22. The monk is a native of Gomar Village in Nyenthog Township, Rebgong County.